On Sunday March 19th, 2017, the artists and curators of Chance Ecologies invite you to a presentation and discussion at UnionDocs, the documentary collective in Willamsburg, Brooklyn. 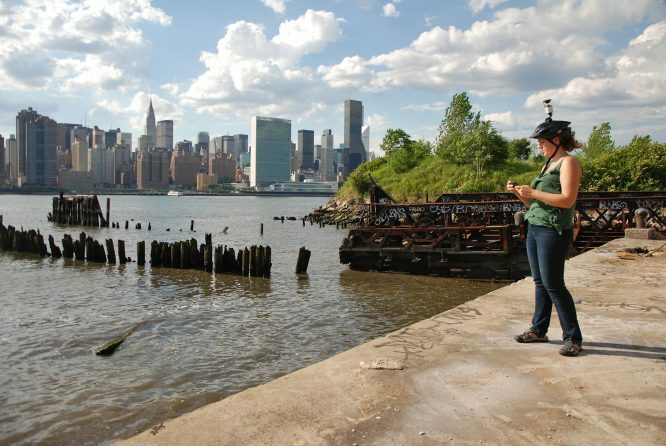 Since 2015, the artists of Chance Ecologies have been creatively engaging the post-industrial waterfront of Queens, New York. Their work has included seed collecting, interactive mapping, experimental filmmaking, guerrilla archaeological digs, and public participatory actions in off-limits areas. Though not necessarily intended as documentary, the artworks created by Chance Ecologies have helped to capture the story of endangered landscapes and species, as the city’s last unprotected pockets of unmanaged wilderness are turned over to developers and bulldozed. This event will dig into the role of artists and citizens in engaging the history of pollution and neglect that has shaped our current version of urban “nature.” As the environment continues to be radically reshaped by human impacts, including globalization and climate change, how can we creatively investigate these fragile landscapes? And in the face of global mass extinction, how do we create empathy for the forgotten species in our own backyards? Presentations by several of the artists from this unique collective project will be followed by discussion with curators Nathan Kensinger and Catherine Grau. Edrex Fontanilla and Sarah Nelson Wright will discuss their project Hidden Vistas, a virtual reality installation that cultivates empathy for places that no longer exist or are too hazardous to visit. Dillon de Give will speak about the Coyote Walks, a walking residency that traces the potential pathways that coyotes are using, as they enter New York City for the first time in their history. Ellie Irons will discuss her work with the spontaneous plants that thrive in urban landscapes, which are often derided as weeds, including her projects Feral Landscape Typologies, The Next Epoch Seed Library, The Sanctuary for Weedy Species, and Invasive Pigments.